I blogged about Butterfly back in February. I knew I’d eventually make it but now that it’s August I thought I’d wait until early next year. But once I saw Ei’s Finished Butterfly I just couldn’t wait any longer. So I ran out yesterday morning and bought some KSH in Jelly — a green that’s not too dark and not too limey for me. I got home and cast on right away and here’s where I am this morning. That hem was the hardest part of the knit, so the simple 8 row repeat of the center panel should go quicker. I hope, because for now it’s to hell with Zipo, the second sockapal2za sock, or my knee highs. Right now, I have a Butterly to catch. you and i have freakingly similar taste at times. i bought some kidsilk haze back in march to make butterfly with…and after seeing ei’s am tempted to start knitting it now! I can see why….goregous Jody! I’m all over Butterfly too. I’m kicking myself as I just placed a order last week that included Kid Silk Haze and forget to include the balls I needed for Butterfly. Loving the green. I go weak at the knees when it comes to it. I may do that colour myself. Love that tank, strung the beads to make it, I just don’t know if I’m a very good lace knitter. 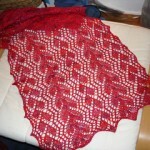 Besides I have another lace project I need to finish first. GGGGRRRR!!! Awesome!!! It looks beautiful in the Jelly. I just love this cami!!! I can’t wait to see more of her progress. I LOVE the color!! I only wish I had more time cause I’d knit this in a heartbeat! Wow- the color and pattern are outrageous! I can imagine how long the 8 lines took to do. Sometimes I just need to do something that takes concentration to knit, and other times I look for mindless knitting patterns. i have been wanting to knit that since i first saw it but really think i should steer clear of any complicated lace for a while (after i tried knitting lacy cami from vk, and it was a huge disaster). i know yours will look fabulous though! I started this weekend and am LOVING it! It’s addictive, isn’t it? I’m about 2 pattern repeats up the back now, and had to force myself to put it down last night! 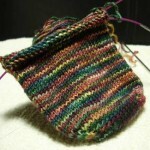 I love the Jelly color you chose – it is going to be so gorgeous and it’s a great color for you. (I’m still sticking with that you’d look great in purple, but the green is fabulous for Butterfly!) Can’t wait to see your progress – post more pictures soon!! That green is so lovely! Perfect color! Yes the butterfly is soooooooooo tempting! Can you believe I wont read blogs somedays just because I know I’ll be tempted to run out and buy a new project and new yarn too of course! I can’t wait to see your completed butterfly too! Lovely lace! I just read your sock question and all I can offer is what I did myself: I kept the same number of stitches for the ribbing and added elastic thread to finish them. But decreasing stitches sounds like a better idea. 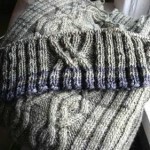 i am knitting this one, too. i am almost done with the hem, and am doing it in round! love the green color you are using! I blame it on Ei too I’m done with my first side and will be posting pictures soon! I love the green you choose. I’ve just started Butterfly, and I have to agree with you on the hem – there was no way that I could memorize the rows – I just had to sit, with no distractions, and do it! I had incredibly tight sholders afterwards. 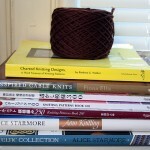 I guess the hem is what earns the pattern its 3 skein rating. Is there a more updated version of EIKNIT.com. Have not seen any new posting since OCt 08.